~Diana's recently-published 136-page book: Acupressure Methods for Horses: Calm Your Horse, Support Health, and Improve Performance with 8 Powerful Points. ~ 6 online videos with more than 45 minutes of acupressure lessons. 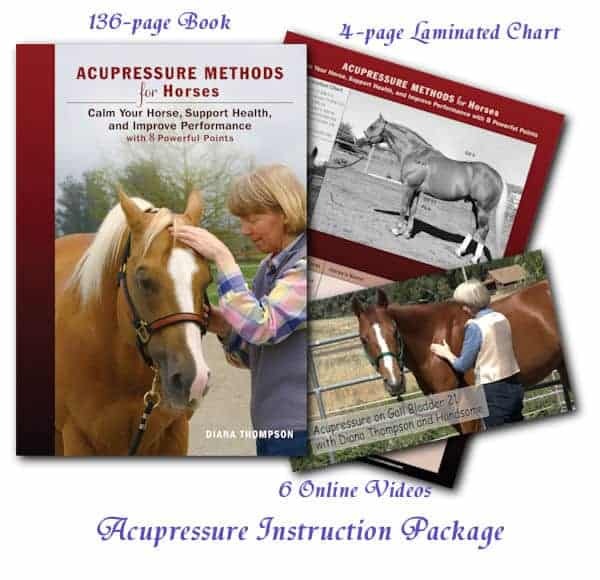 ~ Diana’s new Acupressure Instruction Package with the 136-page book: Acupressure Methods for Horses, a 4-page color laminated chart, and 6 online videos with more than 45 minutes of acupressure lessons. ~ The 272-page flip chart book: Acupressure Point Charts for Horses, An Illustrated Guide to 128 Point Locations and Uses, which includes 400 photos, 100 illustrations, and subject charts with point combinations for many health situations. ~ The 6-page color laminated chart Emergency Point Charts for Horses that gives veterinary information and acupressure points so horse owners can support their horses in medical emergencies and illness. - Instructions on how to apply acupressure in many different situations. Order the book Acupressure Point Charts for Horses, An Illustrated Guide to 128 Point Locations and Uses and receive the 6-Page laminated chart Emergency Acupressure Points for Horses for just $5.95. A savings of $7 on the combined purchase price! This 6-page color laminated chart provides medical information and acupressure points so horse owners can support the horse in illness and in medical emergencies. The chart was printed on thick card stock paper and laminated to make it waterproof. This design makes it ideal to keep in the barn, tack trunk or horse trailer. You are welcome to try our product for 30 days. If it does not meet your satisfaction, ship it back (clean and undamaged) with a copy of our invoice and we will refund your payment. The cost of return shipping is your responsibility. All products are quality guaranteed. If there is any defect in workmanship or materials send us the product insured mail or insured UPS and we will send you a new product and refund your shipping expense.